We reflect on a tragic Friday over 2000 years ago, when an innocent man called Jesus was brutally beaten, tortured, and crucified. Jesus passionately allowed it because of a greater purpose that includes you. Jesus loves you. The word passion means suffering, compelling, and intense feeling or emotion, a pursuit to which one is devoted; the last suffering and death of Jesus Christ. • His torture was for torment. • His judgment was for every time you are unfairly judged. • His betrayal was for grace when you are betrayed. • His desertion by His disciples was for when people you need are not there. • He was despised for victims of racism, prejudice, poverty, slavery. • His blood was shed for your sins. • His wounds were for your sickness. • His punishment was for your peace. • His death was to destroy the power of death. The cross without the resurrection would have meant victory for Satan but the cross was only a journey with great purpose. Because He lives, we too shall live. There is victory beyond every battle you face and hope beyond all your fears. It was a Good Friday when Jesus in one blow on the cross conquered death, Satan, and the grave. Hallelujah! The cross of Jesus is my weapon to destroy all evil. “We ought always to thank God for you, brothers, and rightly so, because your faith is growing more and more, and the love every one of you has for each other is increasing.” 2 Thessalonians 1:3. Faith grows but only if you exercise it. A body builder grows his muscles by exercise, lifting weights and stressing his muscles to different levels of strength until it tears, repairs, and grows. 1) By hearing and applying the Word of God. “Consequently, faith comes from hearing the message, and the message is heard through the word of Christ.” Romans 10:17. Sometimes God’s Word is contrary to how we feel, such as, “Forgive when someone betrays you; Praise God in every situation; and Love when all else fails.” One thing we prove more and more as we mature in Christ, “God knows what is best for the health of our body, soul, and spirit.” Pray and obey God. 2) By taking risks. If you don’t have the guts to try you’ll never have the power to succeed. If you don’t have the faith to take a risk, you will never know the pleasure of the rewards. To succeed is to overcome obstacles, to take new territories, and to conquer old fears. Charles Spurgeon says: “Faith obliterates time, annihilates distance, and brings future things at once into its possession.” Faith in God brings security. It anchors us in peace and holds us by its power. Have faith in God. My faith is in God and my peace is from Him. “When Abram heard that his relative had been taken captive, he called out the 318 trained men born in his household and went in pursuit as far as Dan.” “He recovered all the goods and brought back his relative Lot and his possessions, together with the women and the other people.” Genesis 14:14,16. Abram fought for his family and brought them back everything that was stolen from them. Families are important to God and He tells us how to fight for our families. Abraham had a trained army and weapons to fight for his family. God has given you spiritual weapons to fight for your family. 1) The Armor of Jesus. “Finally, be strong in the Lord and in his mighty power. Put on the full armor of God so that you can take your stand against the devil’s schemes.” Ephesians 6:10-11. 2) The Name of Jesus. “At the name of Jesus every knee should bow, in heaven and on earth and under the earth, and every tongue confess that Jesus Christ is Lord, to the glory of God the Father.” Philippians 2:9-11. 3) The Blood of Jesus. “They overcame him by the blood of the Lamb.” Revelation 12:11. 4) The Word of God. “Take the helmet of salvation and the sword of the Spirit, which is the word of God.” Ephesians 6:17. Read your Bible and declare the promises of God about your family. 5) Praise God. “As they began to sing and praise, the LORD set ambushes against the men of Ammon and Moab and Mount Seir who were invading Judah, and they were defeated.” 2 Chronicles 20:22. The LORD will defeat the enemies against your family as you praise, pray and declare His Word. No weapon formed against my family will prosper. Watch out for the voice of Jezebel. The doctor can speak to you with that voice, “You may have cancer.” The banker can speak to you with that voice, “You may lose your home.” A spouse can speak to you with that voice, “I am going to divorce you.” An enemy can speak to you with that voice, “I will destroy you.” Depression can speak to you with that voice, “I subdue you.” Lust can speak to you with that voice, “I control you.” Fear can speak to you with that voice, “I own you.” Don’t let the voice of Jezebel intimidate you. In fierce anger Jezebel sent a death threat to Elijah. He was very tired from battle after battle and he succumbed to the voice of fear and intimidation. He ran from Jezebel, became depressed and wanted to die. When the battle is too long, when you are tired and overworked, when you are overwhelmed by your circumstance, be careful of the voice of Jezebel and her master, Satan. 1) Call on the Name of Jesus. In your desperation, His Name will begin to work for you and release His strength and keeping power. 2) Have faith in GOD. Let words of faith be more powerful than the voice of fear. 3) Plead the blood of Jesus to protect you. There is power in the Blood of Jesus. 4) Work the Word of the LORD. Read the Bible, speak the Word of LORD, sing praises, and the demonic kingdom with all its agents will be subdued. 5) Praise God. God dwells in the atmosphere of your praises and keeps His angels fighting for you. Jesus is EL CHAYIL, LORD of Armies King of Glory. God who is with me is greater than all my enemies. “The Lord turned to him and said, “Go in the strength you have and save Israel out of Midian’s hand. Am I not sending you?” But Lord,” Gideon asked, “How can I save Israel? My clan is the weakest in Manasseh, and I am the least in my family.” The Lord answered, “I will be with you and you will strike down all the Midianites together.” Judges 6:14-16. Gideon suffered from poor self-image. The Bible talks about ‘strongholds’ in the mind. Strongholds are patterns of thinking that controls our imagination, attitudes, and our actions. Gideon’s identity was that he was the weakest of the weakest in his culture and family. Negative patterns of thinking are dangerous because it undermines God’s Word, the truth, and your faith. “As a man thinks in his heart so is he.” We become what we think about ourselves. Negative thoughts steal our time; keep us from living in the moment; steal our energy; make us weak; give life to negative imaginations to make them a reality. As a small snowball, rolling down a hill becomes bigger and faster as it goes down the hill, so negative thoughts rolling around in your mind becomes bigger and stronger until they become controlling power in your mind. God tells us what kind of thoughts to think about yourself: “Finally, brothers, whatever is true, whatever is noble, whatever is right, whatever is pure, whatever is lovely, whatever is admirable – if anything is excellent or praiseworthy – think about such things.” Philippians 4:8. When you think positive thoughts about yourself, it will grow and become a stronghold of your mind and eventually your reality. With God, all things are possible through me and for me. “The disciples went and woke him, saying, ‘Lord, save us! We’re going to drown!’ He replied, ‘You of little faith, why are you so afraid?’ Then he got up and rebuked the winds and the waves, and it was completely calm.” Matthew 8:25,26. Fear can be powerful if you allow it to control you. It paralyzed the entire army of Israel with just the shouting voice of a giant. It made the disciples of Jesus forsake and deny Him at His most difficult time. Job declared: “What I feared has come upon me; what I dreaded has happened to me.” Job 3:25. Fear attracts power to perform what we fear. Faith, on the other hand attracts the power of God to perform what we believe. Bart Simon survived a plane crash that killed twenty-seven people. After surviving such a traumatic experience, no one would blame him if he chose never to fly again. However, on the Monday, the day after the crash, he climbed aboard another airplane and flew safely home to Cleveland. He made the decision not to succumb to fear but to overcome it with a fight, determination, and passion. He refused to let fear ground and inconvenience him forever. “For God has not given us a spirit of fear, but of power and of love and of a sound mind.” 2 Tim 1:7. The way to overcome fear is to put your faith in God, have faith in yourself, and to face fear head on, as you speak the Word of the LORD. David ran towards the giant Goliath with the Word of the LORD and he not only conquered fear, but he also killed the giant. Faith in God is a powerful force that will make all things possible for you. God did not give me a spirit of fear, but of power, love, and a sound mind. “But the angel answered and said to the women, “Do not be afraid, for I know that you seek Jesus who was crucified.6 He is not here; for He is risen, as He said. Come, see the place where the Lord lay.” Matthew 28:5-6. It appeared that the enemy had won. Jesus Christ was tortured, deserted, hung on a cross, and died in shame. He was buried in a tomb and a large stone place at its entrance. There were soldiers guarding the tomb. On the third day, the women who loved and remained faithful to Jesus went to His tomb to embalm His body. They did not know how they would roll away the great stone that guarded His coffin but they went anyway. When they went to the tomb to their surprise Jesus was no longer there, He had risen just as He promised. 1) Move towards your miracle even if you haven’t figured it all out. The women didn’t know how they were going to get to His body but they started out with what they had. Your faith and actions will release the supernatural. 2) God will meet you at your point of faith. When the ladies went to the tomb the stone had been rolled away. They didn’t have to do what they were unable to do. Do what you can and God will do the rest. 3) Believe in the word of the Lord. Whatever God promises, He can and will perform. He had boldly declared: “After three days I will rise again.” He did. Whatever God has promised you, He will do. My God shall supply all my needs according to His riches in glory. The Bible encourages us to grow in faith and love as you wait to receive the mercy of God. Sometimes the strongest evidence of faith is not when we get the promises, but the fruit of our lives when we are waiting for the fulfillment. In times of waiting, our character is tested; patience, strength, conviction, and love are tested. Sometimes the ones you love hurt you the most; the ones you give to, deny you the most; the ones you reach out to, resist you the most; yet you keep believing, hoping and praying because your faith is mixed with love. Inside of Jacob, the trickster was Israel the Prince; inside Mary Magdalene, the sinner woman, was a saint. Faith mixed with love transformed their lives. Faith keeps us praying and love keeps us reaching. It is just like Jesus to have faith in us and then to love us through our journey. His love keeps us, gives us hope, redeems our mistakes, and cheers us on to the finish line. Faith and love are the wings of victory that keeps us soaring while His mercy is always their there to catch us if we fall. I am secured in the love of God and kept by His mercy that is new every morning. “In his heart a man plans his course, but the Lord determines his steps.” Proverbs 16:9. When God told Joshua to take the people into the promised land, Joshua was sure of one thing: it would not be an easy road. His first challenge was to cross a river at flood stage, then he had to go beyond a great wall guarded by enemy soldiers. Joshua, however, found out that all that God expected from him was faith to step toward the promise, to keep moving forward, and to keep listening for guidance along the way. God is already ahead of you putting bridges and steps for your safety and direction along your way. Where there is no bridge, the water will divide. Have faith, step toward the promise and keep moving forward. God’s glory goes before you and His glory guards you from behind. “Then your light will break forth like the dawn, and your healing will quickly appear; then your righteousness will go before you, and the glory of the LORD will be your rear guard.” Isaiah 58:8. The LORD my God is with me and goes before me to light my path. “For Christ did not send me to baptize, but to preach the gospel – not with words of human wisdom, lest the cross of Christ be emptied of its power. For the message of the cross is foolishness to those who are perishing, but to us who are being saved it is the power of God.” (1 Cor. 1:18). The plan of the execution of Jesus Christ on the cross included: cruel beatings, torture, torment, shame, and death. Pilate ordered the torture of Jesus as a substitute for His murder to satisfy the hatred of the religious and political leaders. He hoped that they would be moved to compassion to spare the life of the innocent Jesus. However, evil can drive its agents to the ultimate and then to their own destruction. The people roared with excitement at the sound and sight of His torture, shame, and death. The death of Jesus on the cross seemed like the death of a dream, but God was in control. The cross was a symbol of God’s power in action to satisfy the punishment for all the sins, failures, and shame of all people. His torture was to heal our sickness; His shame took the place of our guilt; His blood cleansed us from sins; and His death gave us eternal life. Jesus went the way of the cross to secure our total freedom and eternal life with Him. This reminds us that whatever we may face in life, God is in control and working behind the scenes for a greater plan. In His care, all things shall work together for good for those who remain in faith and in His love. The cross took my sins, failures, and shame. I am free by the power of the cross. Dr. Pat Francis brings news of Jesus Christ to transform lives around the world as an international speaker. The teaching of hope, empowerment, self-enterprise / business independently and have dominion kingdom mendampaki thousands of people. He is an international humanitarian, author, recording artist and host of the weekly TV program "Good News with Pat Francis'. 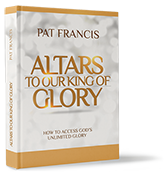 This book will Transform Your Life as you begin to understand the Principle, Privilege and Power of building Spiritual Altars to our King of Glory.